Hiya guys! Before we get into this, you best be seated and maybe even grab yourself a snack. It's time for the weekend and I have a very exciting post to share because it involves a new brand on the scene that actually isn't new to the polish world. Okay, let me explain haha. Rachel part owner of Ever After Polish has parted ways and launched her own brand Rogue Lacquer. Not to worry though, Ever After Polish still continues on strong with Miranda. Now for today I'm sharing swatches for the debut collection Spring Punk by Rogue Lacquer, which features four gorgeous shades in a variety of finishes. The brand is coming out the gate so strong, I can already tell you it's a must have collection. Without further ado, let's get to the swatches! 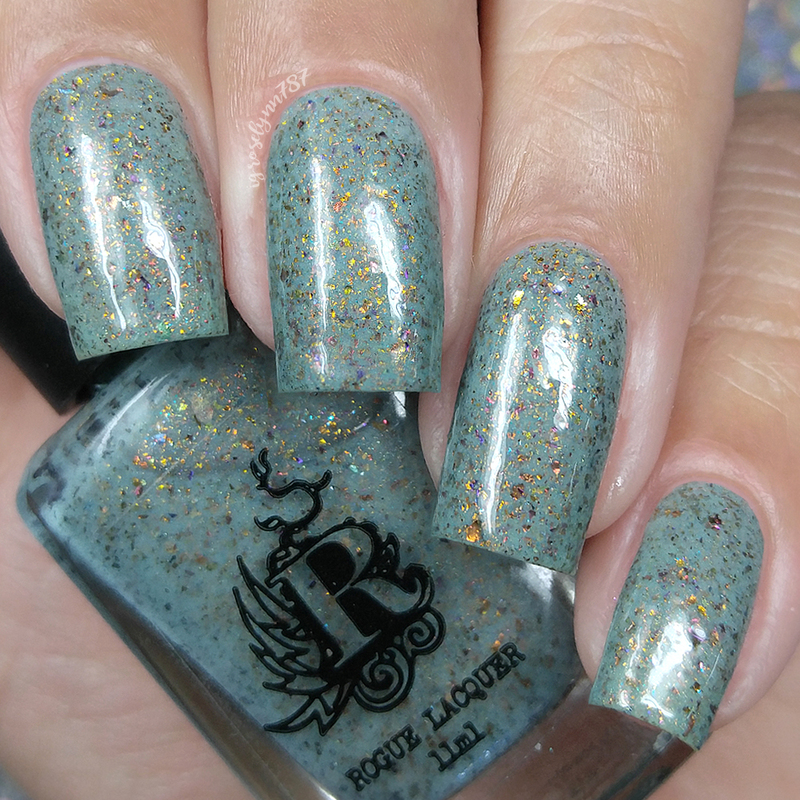 The Spring Punk Collection by Rogue Lacquer will be available for purchase this Sunday, April 15th at 10pm EST. Each full-size 11mL shade retails for $10 or the entire collection can be purchased as a bundle for $38. Blowing Off Steam can be described as a blue-grey steel creme with silver flecks, holo, and blue shimmer. I don't know where to even begin with this shade, but photos cannot do the finish any justice. It's a stunning combination and the tone of the base really comes to life with the sliver flecks. Just take a look at the macro to get a sense of what killer dimension and depth it has. Definitely starting off this review with one of my favorites and one that I have to say is a must-have. 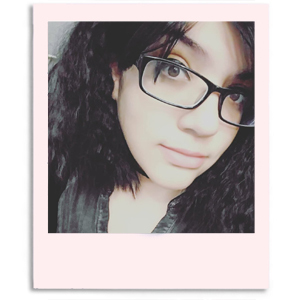 The hue also compliments my skin really nicely and doesn't bring out too much warmth. The formula has a good opacity that builds-up nice and evenly throughout the application. Consistency wise it leans a little on the thick side, but is manageable enough for easy layering. Plus the good opacity in each coat allows for ease in the build-up. It dries down to a minimal gritty finish that smooths out perfectly after topcoat and also has a natural high-shine. Shown in two coats and sealed with a glossy topcoat. Grinds My Gears can be described as a metallic, bronzed gold with crimson shimmer, micro holo glitter, and holo sparkle. And speaking of favorites... I know, I know. They can't all be my favorites, but how can you turn the other cheek to a polish so sparkly? And you guys know that you can never have too much sparkle in life. What I tend to love most about this shade is the bronze gold color of the base, it's nothing something I have a lot of in my collection. Mostly because golden hues bring out too much warmth from my skin-tone, though that is certainly not the case here. Hence all the extra love my little heart has for this beauty! The formula has a sheer application with a fantastic build-up for complete coverage. The consistency feels very balanced throughout and neither too thick or too thin. It has so much sparkle and shine to the finish, much more than photos could hope to capture properly. And you also obviously get a much better touch of the holo and shine under direct sunlight... aka the thing I have none of in my swatching attic haha. Now it dries down to a very minimal gritty finish that smooths out after topcoat. Shown in two coats and sealed with a glossy topcoat. Retro Future can be described as a minty seafoam with turquoise sparkle, soft linear flame, and copper, silver, bronze, and gold chrome flakes. And if there were ever a polish that would make jaw drops this would be it for everyone. It's such a gorgeous combination that I am having trouble forming words to describe it to you guys. Right off the bat I have to say the flakes are everything. It meshes so well against the color of the base and gives the overall polish a regal vibe. And it's one of those colors that looks so beautiful with any skin-tone and doesn't clash. The formula has a very sheer application that ends up building up perfectly for full coverage. It has a great balanced consistency throughout, not too thick or too thin. Definitely a nice surprise considering how flakie filled the base is. Speaking of which, the flakies have a great distribution that doesn't clump at all throughout the layering. It dries down to a gritty finish that smooths out after a nice thick layer of topcoat. Shown in two to three coats and sealed with a glossy topcoat. 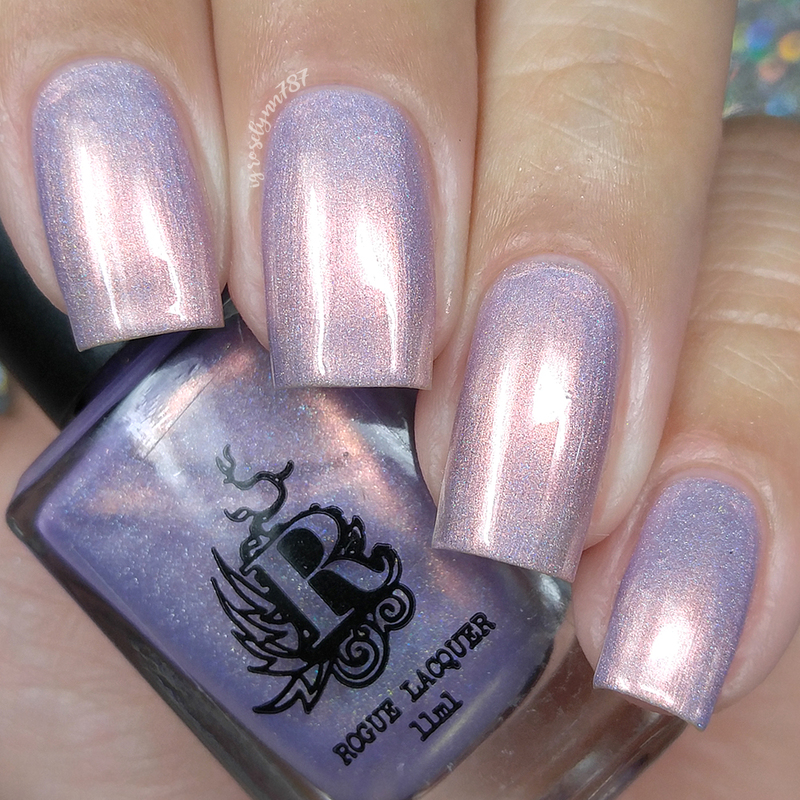 Steam Punk Fantasy can be described as a dreamy, soft lavender holo with intense copper shimmer. Closing out this review with my favorite from this collection. Heck this shade will likely make my must-have list for the year. The hints of copper shimmer really give the soft base a captivating sparkle and adds depth to the otherwise simple finish. It also looks really gorgeous against my skin-tone, which is not something I find often with lavender shades. So many pluses all around it's no wonder why I am going ga-ga over this polish. I hate to sound like I am gushing so much in a review, but when a collection is a winner it overwhelms me. I love this shade, I love this collection, and you need it all. Enough said. The formula has a very sheer application that builds-up really well for full coverage. It has a perfectly balanced consistency once again and layers with such ease. There are minimal brush strokes in the finish, but mostly all blend out as it dries. The finish is super smooth and high-shine on it's own as well. Shown in three coats and sealed with a glossy topcoat. To recap, Spring Punk Collection by Rogue Lacquer will be available for purchase this Sunday, April 15th at 10pm EST. Each full-size 11mL shade retails for $10 or the entire collection can be purchased as a bundle for $38.